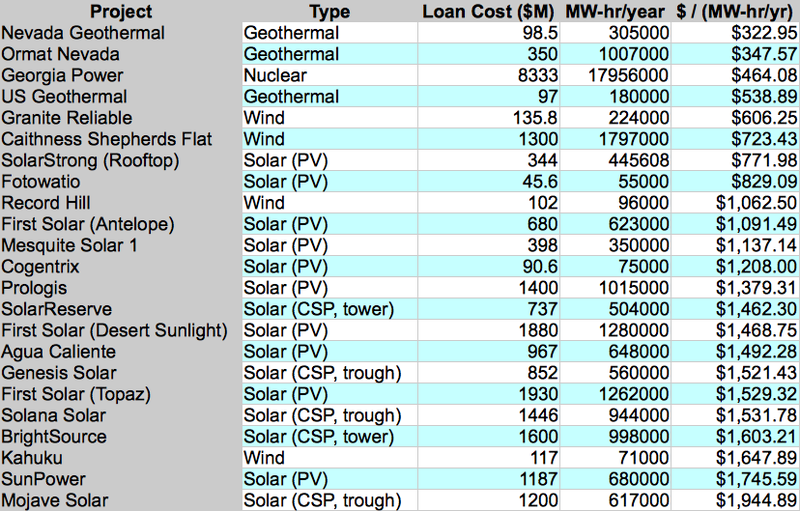 I've been planning this post for months, but the recent Solyndra press (and the negativity that it's bringing on the whole program) has spurred me into getting off my duff and actually writing about it. Initially, the government gave a $535 million loan guarantee to a company called Solyndra, which needed additional funding to help start up its innovative new way of making solar panels. The term "guarantee" is important here, because the government is just providing a guarantee -- it's not actually loaning out any money. The federal government isn't on the hook for any money unless the company defaults and goes bankrupt. And -- even if the company does go belly up -- the government usually secures the right to be "first in line" for grabbing any leftover assets that the company may have had. So, if the unthinkable does happen, at least the government can go in, collect all the inventory, and hopefully auction it off and salvage some of the money. Initially, the reports on the Solyndra case were very negative. "OMG!!" they reported. "A government funded program went bankrupt!!" No matter how you slice it, higher risk == higher potential of failure. At first, I thought people were unwilling to accept this. But then things got juicy, when it appeared there may have been a connection between Solyndra, one of its financiers, and the Obama Administration. And then the Solyndra executives are going to plead the 5th amendment when they have to testify? Yeesh. It also appeared that, back in May or so, the government re-structured the loan guarantee so that it no longer had first-rights to the assets in case Solyndra went belly up. Giving up these first rights was apparently a last-ditch effort to raise more funding for Solyndra. MAKE PUBLIC THE INDEPENDENT ENGINEER'S REVIEW. For every loan that is granted (and for those that are not), the Loan Program Office brings in an independent engineering firm to review the project from top to bottom, soup to nuts. The Independent Engineer writes a (sometimes exhaustive) review to characterize the risks and the likelihood of success. It should be readily apparent from this review (along with any follow up reviews that may have been done) whether the Solyndra business venture was really viable or not. The fact that it hasn't been released is somewhat concerning to me ... I have a suspicion that if that independent review was a glowing one, then it would have already been released. I decided to take a step back, and thought, "What else has the Loan Program Office been up to, and what investments tend to have the biggest payoff for the taxpayer?" Conveniently, the Loan Program Office lists all of its projects funded to date, the amount of the loan guarantee, and some other stats about the project. 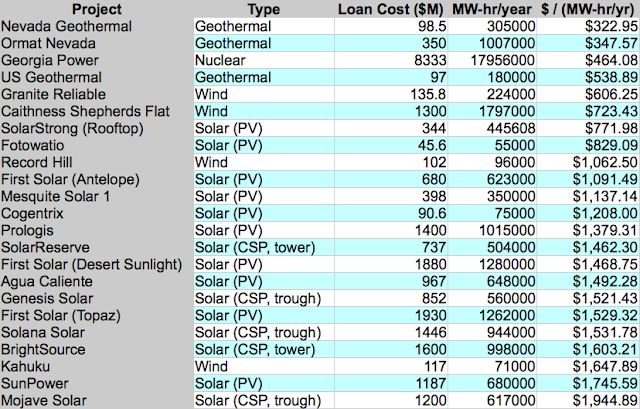 Most notably for me, the total expected number of megawatt-hours (MW-hr) each project is supposed to produce, annually. In layman's terms, the annual MW-hr figure is the amount of JUICE the plant can crank out per year. So, which projects crank out the most juice for the lowest investment cost? I copied the data as published on the DOE site, and compiled it into a table. Wow. Geothermal is cheap. I was surprised at that. Right after that is nuclear, which I was pleasantly surprised to see. 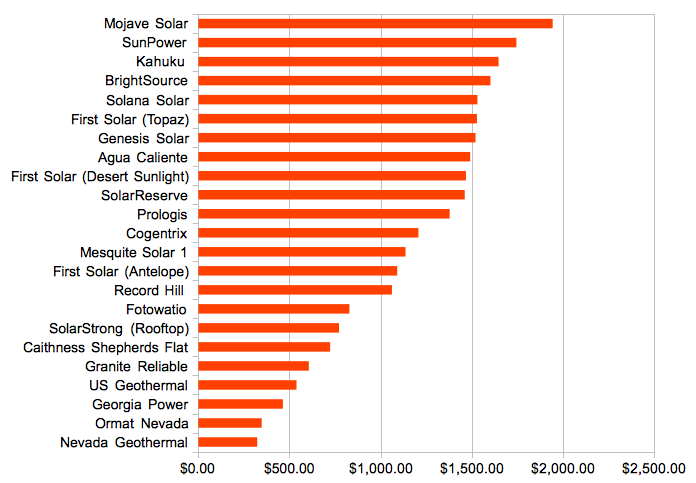 And solar, no matter how you slice it, is still pricey. Wind is somewhere in the middle. I was, however, encouraged to see that the rooftop solar project (putting solar panels on rooftops, and in this case at military installations) was the most affordable of the solar bunch. Personally, I have always liked that idea -- we're not using our rooftops for anything else, so we might as well stick some solar panels up there and use the energy productively. This is a very comprehensive post about loan guarantee program. I still think that the program is needed to create jobs. And based from what you have said, it also supports innovative and new technologies for making electricity which is a good thing for the community.